in the comfort of your home or best location. 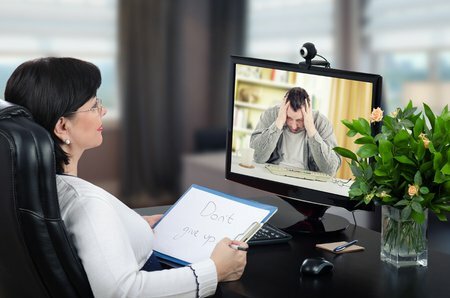 Life Enrichment Counseling Center, Inc., is pleased to provide HIPPA compliant online therapy also known as e-therapy for appropriate clients who prefer this counseling method vs. therapy in a traditional office setting. Online therapy will be available for existing clients who are deemed appropriate for this type of therapy. If you are a new client interested in e-therapy, you must first schedule an appointment with our office and be evaluated by one of our therapists to determine if this type of therapy is an appropriate method based on your needs. All videoconferencing sessions are encrypted through Doxy.me, to maintain confidentiality. 2)	A convenient option if you are not feeling well enough to come to the office, but you are still in need of talking to your therapist. 3)	You are going to be away at college and want to continue meeting with your therapist. Clients who are interested in this type of therapy must first meet the following criteria. 2)	Clients must be mentally stable with no ideation to harm self and others. 3)	Clients must be an existing client or receive a brief phone consultation to assess his/her mental health state for this type of therapy. 4)	Clients must go to https://doxy.me on their computer using Chrome or Firefox or download the doxy.me app on their phone to participate in a video conferencing session. 5)	Clients must have the necessary technology to participate in videoconferencing sessions. If you are interested in receiving online therapy, please discuss it with your assigned therapist. If you are appropriate to proceed, your therapist will provide their Doxy.me login account and scheduled time to meet. If you are new and would like to be assigned a therapist to determine if you are an appropriate candidate for online therapy, please contact our office and request an initial consultation. You will then be assigned a therapist to meet with you.